DeFelsko manufactures instruments that measure the thickness of powder coatings on a variety of substrates before or after cure. This article describes measurement solutions and lists appropriate ASTM testing documents. Thickness measurements of powder can be taken before and after curing. Substrate type, thickness range, part shape, and economics determine the best method to be employed. For uncured applied powders, height measurement can be performed with powder combs and with magnetic gages employing special powder probes. These techniques are destructive and may require recoating the part. Coating powders generally diminish in thickness during the curing process so these procedures require a reduction factor be determined to predict cured film thickness. Ultrasonic instruments also measure uncured powder, but do so without touching the surface. Instead of measuring powder height, they automatically display a predicted cured thickness result. 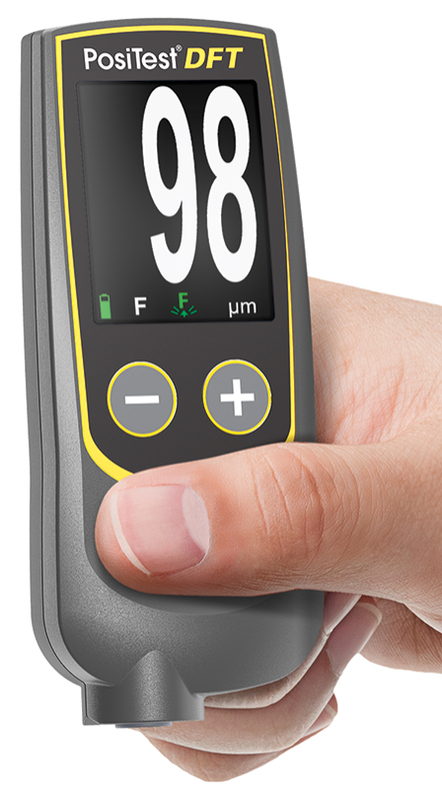 For after-cure measurement, a variety of hand held instruments are available. These non-destructive instruments employ either magnetic, eddy current or ultrasonic principles depending on the substrate. Less common methods include micrometer measurement, destructive dry film methods such as cross-sectioning and gravimetric (mass) measurement. We begin with a discussion of post-cure measurement simply because cured thickness targets are the values most often supplied by both powder manufacturers and coating specifiers. Dry film thickness (DFT) instruments are common, affordable, non-destructive, and easy to operate. They employ magnetic, eddy current or ultrasonic principles depending on the substrate. Three principles of operation are employed. 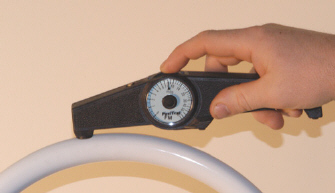 A magnetic principle is used to measure non-magnetic coatings on steel parts. For the other metals, an eddy current principle is used provided the coating is non-conductive. For non-metals, an ultrasonic principle is used. When the part is made of steel, measurements are made with a magnetic thickness gage using either mechanical or electronic operation. Mechanical pull-off gages use a permanent magnet. Cured thickness is determined by measuring the force required to pull that magnet from the coated steel surface. Magnetic pull-off gages are rugged, simple, inexpensive, portable, and usually do not require any calibration adjustment. They are a good, low-cost alternative in situations where quality goals require only a few readings during production. DeFelsko manufactures two mechanical instruments. The PosiTest FM is a rollback dial model comprised of a magnet attached to one end of a pivoting balanced arm and connected to a calibrated hairspring. By rotating the dial with a finger, the spring increases the force on the magnet and pulls it from the surface. It is safe in explosive environments and is commonly used by painting contractors and small powder coating operations.mIt has a tolerance of ±5%. Pencil-type models like our PosiPen use a magnet that is mounted to a helical spring that works perpendicularly to the coated surface. Ideal for small parts or for quick quality checks, the PosiPen has a smaller probe tip allowing it to be placed with pin-point accuracy on small parts, hard to reach areas and curved surfaces. The temperature range of -100 to 230 ºC (-150 to 450 ºF) makes it ideal for taking measurements on hot parts fresh out of the oven. It has a tolerance of ±10%. A variety of electronic instruments are available for measuring on metal parts. They use a magnetic principle when measuring on steel and an eddy-current principle on aluminum. Measurement results are displayed on an easy-to-read liquid crystal display (LCD). Typical tolerance is between ±1 and 3%. Our basic electronic solution is called the PosiTest DFT. Two models are available, each capable of measuring up to 1000 microns (40 mils). The PosiTest DFT Ferrous model is recommended for steel substrates, while the PosiTest DFT Combo model is ideal for measuring on all metal substrates. 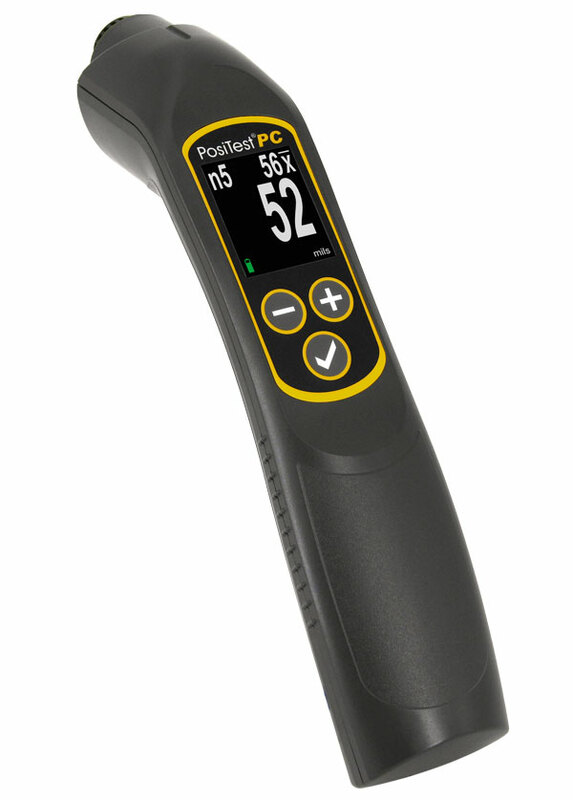 Our most popular instruments for powder coaters are the PosiTector 6000 series of gages. They are ideal for the non-destructive measurement of powder coating thickness on metal substrates. 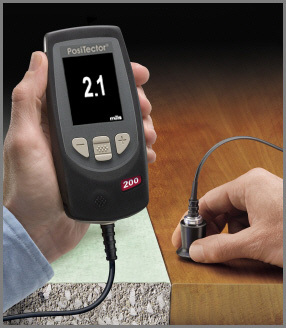 Various models of the PosiTector 6000 are available including an F series for steel substrates, an N series for non-steel substrates such as aluminum, and an FN series for measuring either application. Higher accuracy ferrous or non-ferrous Microprobes, with a range up to 625 microns (25 mils), are available for measuring in smaller, hard to reach areas. Advanced models can store and print/download readings. As more customers purchase coating thickness gages to verify the quality of incoming products, it is becoming increasingly important that powder coaters have the ability to permanently record quality control data. Some powder coaters have even taken the next step of providing their customers with unsolicited reports showing the coating thickness readings as evidence of their process quality. ASTM Practice D7091 describes non-destructive measurements over metal substrates made with magnetic and eddy current coating thickness gages. Magnetic and eddy current instruments measure powder over metals. Non-metal applications such as coated plastic and wood require an ultrasonic pulse-echo technique. Ultrasonic testing works by sending an ultrasonic vibration into a coating using a probe (transducer) with the assistance of a gel (or drop of water) temporarily applied to the surface. This relatively new advancement allows industries to perform non-destructive quality control at an affordable price. 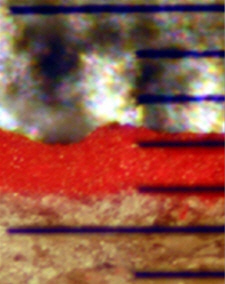 A benefit to this measurement technique is the possibility of measuring the individual layers in a multi-layer coating system. 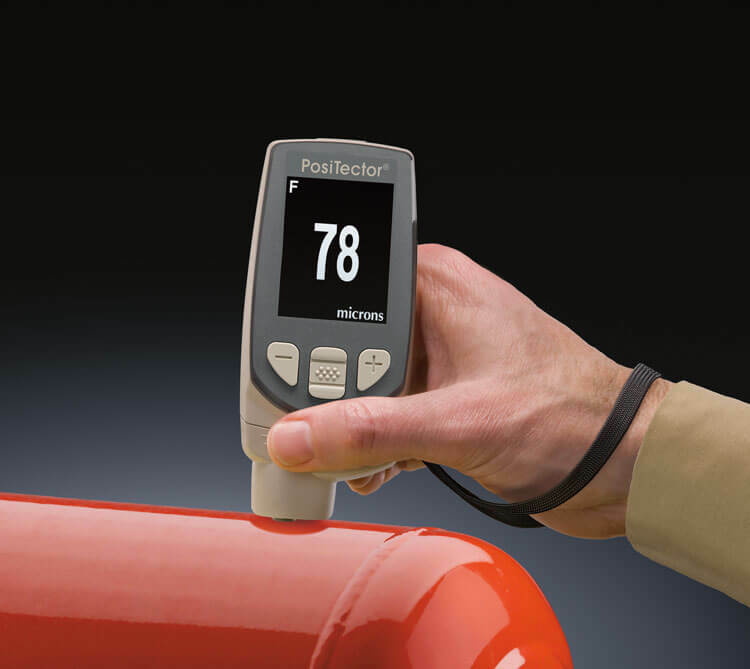 Our ultrasonic PosiTector 200 B Std is ideal for measuring the thickness of powder coating applied to non-metal substrates. It has a range of 13 to 1000 μm (0.5 to 40 mils). ASTM D6132 describes this test. 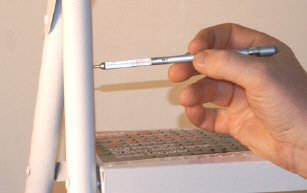 Micrometers are sometimes used to check coating thickness. They have the advantage of measuring any coating/substrate combination but the disadvantage of requiring access to the bare substrate. Two measurements must be taken: one with the coating in place and the other without. The difference between the two readings, the height variation, is taken to be the coating thickness. Two destructive techniques are available. One is to cut the coated part in a cross section and measure the film thickness by viewing the cut microscopically. The other technique uses a scaled microscope to view a geometric incision through the cured coating. This method is used when nondestructive methods are not possible or as a way of confirming nondestructive results. ASTM Test Method D4138 describes destructive measurements over rigid substrates made with cross-sectioning instruments. Measurement methods described so far take place after the powder coating has cured. But if a coating has been improperly applied, correction after cure requires costly extra labor time, may lead to contamination of the film, and may introduce problems of adhesion and integrity of the coating system. Measuring film thickness before cure can determine the need for immediate correction and adjustment by the applicator. 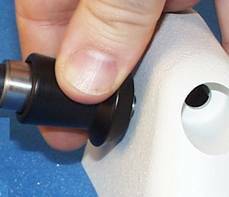 While most powder coating specifications give cured thickness targets, it is possible to determine if applied powder is within thickness specifications before the finality of curing and crosslinking. There are good reasons for wanting an accurate prediction of cured thickness, especially on moving lines. Depending upon the length of the oven, that is, the number of parts being cured, as well as the time required for the curing process and for manual film thickness measurement after curing, there is a considerable delay before the operator can intervene in the application process to make any necessary changes. If coating defects are discovered, a considerable number of coated parts have to be reworked in a repair loop or, if reworking proves to be too expensive, they may even have to be scrapped. For some operations, these disadvantages are no longer acceptable for meeting the demands of modern finishing processes. Measuring powder in the pre-cured, pre-gelled state helps insure correct cured film thickness. It enables the application system to be set up and fine-tuned prior to curing. In turn, this will reduce the amount of scrap and over-spray. Accurate predictions help avoid stripping and re-coating which can cause problems with adhesion and coating integrity. ASTM D7378 describes three measurement methods for the thickness of applied, pre-cured coating powders to predict cured thickness. A. Rigid metal notched (comb) gages. B. Electronic coating gages with a special powder probe. Procedure A uses the inexpensive DeFelsko Powder Comb which works much the same way as a wet film gage. The comb is dragged through the uncured powder and powder height is considered to be a range value between the highest numbered tooth that made a mark and has powder clinging to it, and the next highest tooth that left no mark and has no powder clinging to it. These gages are relatively inexpensive with an accuracy of ±5µm . Various Powder Comb models are available allowing measurements from 75 to 1250 microns (3 to 50 mils) on any substrate. They are only suitable as a guide since the cured film may be different after flow. 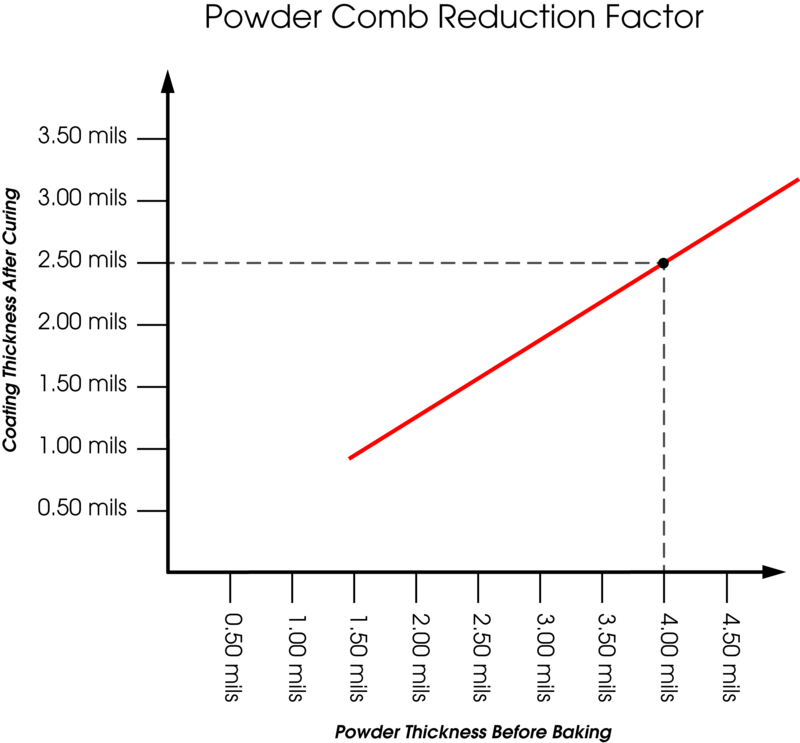 Marks left by the gage may affect the characteristics of the cured film. Procedure B uses a conventional magnetic or eddy current coating thickness gage but with a specially designed powder probe to measure the thickness of the coating powder. Three micro pins, which are integrated into the probe, penetrate the coating powder down to the substrate. The probe is manually pressed down to the surface of the powder to effect a height measurement. This procedure is applicable to metal substrates only. Marks may be made in the powder that may not be covered when the powder flows in the cure process. Procedure A and Procedure B result in only a height measurement of the uncured coating powder. But thickness specifications are most often stated in cured powder thickness. Since coating powders generally diminish in thickness during the curing process, these two procedures require a reduction factor be established to predict cured film thickness for each particular coating powder. This reduction factor is obtained by measuring the cured powder thickness at the same location where the uncured powder thickness measurement was taken. For best accuracy, measurements before and after curing should be taken for different thicknesses. A sample plot of measurement results is shown here. From this plot a reduction factor can be determined and applied to all future dry coating powder thickness measurements to predict cured thickness. Procedure C of ASTM D7378 describes a relatively new type of instrument, the PosiTest PC Powder Checker. It is an ultrasonic device that can be used non-destructively on uncured powder to predict the thickness of the cured film. The Powder Checker is hand-held, battery powered, and works right out of the box for most powders. It’s simplicity of operation and rugged design allows it to be used quickly and efficiently by line operators. Non-contact coating thickness instruments have the advantage of being non-destructive. This means that, after measurement, the measured components can be re-introduced into the process without being damaged. To operate, press the probe button and hold it approximately 18 mm (0.75”) from the part for 2 to 5 seconds. The predicted cured thickness result immediately appears on both the probe and base unit displays. The normal standard used in powder thickness measurement is the mil, where 1 mil is equal to a thousandth of an inch (1/1000”). So if the manufacturer’s specified thickness is 2 to 5 mils, the final cured thickness of the powder should be between 0.002 and 0.005 of an inch. The metric unit of measurement is called the micron where 25.4 microns is equal to 1 mil. 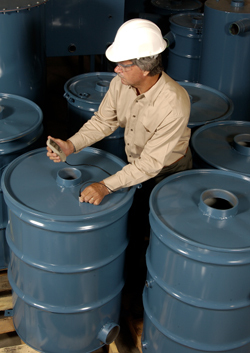 Applicators must apply the powder evenly and according to the product specification sheet. Powder coating continues to be the fastest growing of all the finishing technologies. It is an attractive paint like protective finish that is long lasting, and highly resistant to chips, scratches, and fading. It provides a seamless coating from a virtually unlimited selection of colors, textures and finishes. Powder coating is a cost effective, one step process that doesn’t require successive coats and long curing times. Powder particles used are a mixture of finely ground pigment and resin particles. Charged powder particles are transferred onto an electrically grounded surface. A variety of processes exist for powder application. 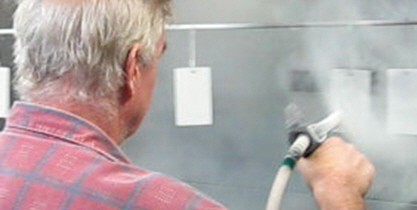 These applications range from electrostatic spraying for thinner coatings (0.001” – 0.010”) to dipping in a fluidized bed for thicker coatings (0.007” - 0.040”). During the curing process the powder is fused into a smooth coating. Dependent on the process, powders are either thermal cured (convection or infrared) or UV-cured. The powders used may be either thermoplastic (same chemical composition after reflowing) or thermosetting (chemically cross-linked with themselves or other reactive components). Powder coating has been used on metal surfaces for over 40 years. Recent advancements have expanded its use into ceramic, plastic (nylon and polycarbonate) and MDF (medium density fiberboard) applications. Studies are ongoing to expand the use of powder coating to include substrates such as hardwoods, laminate floorings and particleboards. Unlike Thermal Cured powders, UV Curable powders separate the melting and film formation stages from the final curing stage. Short wave infrared and convection heat allows relative low temperatures to be used for the melting process. The result is lower temperature curing with improved flow. The UV wavelength and time required for curing is based on the color and expected film thickness. 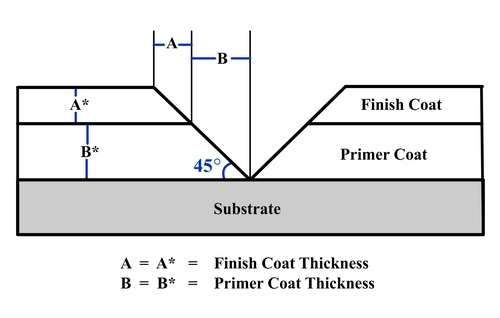 Coating thickness can range from 20 to 100 microns (1 to 4 mils). The most significant challenges of UV-curing are the current cost of the powders required, as well as a need to position the UV light to ensure 100% coverage. Since UV-curing does not require high temperatures to cure, a significant reduction can be attained in required space, conveyors and racking for the cooling process. Unlike thermal, UV provides instant curing which significantly increases throughput. Process savings are significant due to the decrease in energy and equipment required for heating. UV powders are also easy to clean and recycle, while providing a VOC-free process. Available markets are expanded as lower process temperatures allow heat sensitive substrates (e.g. medium density fiberboard and plastics) to be powder coated. The cost of powder coating large mass parts (e.g. engine blocks) that act as heat sinks for thermal curing is also greatly reduced using UV curing. Coatings are designed to perform their intended function best when applied within a tight thickness range as specified by the manufacturer. This ensures optimum product performance. Many physical and appearance properties of the finished coating are affected by the film thickness. Film thickness can affect the color, gloss, surface profile, adhesion, flexibility, impact resistance and hardness of the coating. The fit of pieces assembled after coating can be affected when film thickness is not within tolerance. Therefore, coatings must be applied within certain minimum and maximum film thickness specifications to optimize their intended use. When insufficient powder coating is applied it does not provide adequate coverage and protection. For example, metals require a sufficient coating thickness for adequate protection from environmental effects such as corrosion (steel) or oxidation (aluminum). In addition, inadequate powder coating thickness may result in poor surface finish and undesirable appearance or color. Powder Coating thickness may also affect the application’s impact resistance, flexibility, hardness, edge coverage, chip resistance, weathering, resistance to salt spray, and ability to retain gloss. Manufacturers provide a production specification sheet for powder coat materials. Powder coaters attempt to apply an even coat meeting that specification. Results of powder coating measurements enable the coater to adjust their coating process in accordance to the specifications. On medium density fiberboard (MDF), for example, powder coating thicknesses typically range between 1 and 8 mils (25 to 200 microns) or even higher for thermoplastic coatings. Usually the finish is made more durable with thicker mil coverage. Factory specifications often call for a stated ±1 mil tolerance. This level of quality cannot be determined by just looking at it. There are other benefits to precisely measuring finish thickness whether to meet ISO, quality and customer requirements for process control, or to control costs. When companies fail to check and verify coating quality of incoming material, they waste money reworking product. By checking their application equipment they ensure the coating is being applied in compliance with the manufacturers’ recommendations. Applying excessive film thickness risks the possibility of incomplete cure and can drastically reduce overall efficiency. Too much powder coating may result in poor adhesion and tends to peel or chip from the substrate. Regular testing can reduce the number of internal reworks and customer returns due to finishing defects. High-tech quality-control equipment can help companies maximize coating usage and boost their bottom lines. In the past, costly and complex color and thickness testing equipment primarily catered to larger companies with bigger budgets. However, in the past few years, quality-control testing equipment has decreased in price while advancing technologically, which makes purchasing the equipment more practical and affordable for smaller companies on tighter budgets. Technology advancements have been the key to the growing availability of thickness testing equipment. These improvements have helped manufacturers produce devices that are smaller and more portable, rugged and simple to use. Thickness gauges have also dropped in price because the materials used to produce them are more abundant. The same materials are mass produced for use in cell phones, PDAs and computers. Measurements of powder coating thickness can be made using different methods depending upon the substrate and whether the test is being performed before or after powder cure. ASTM has a series of documents describing these techniques. Practice D 7378 describes three measurement methods for the thickness of applied, pre-cured coating powders to predict cured thickness. Practice D 7091 describes non-destructive measurements over metal substrates made with magnetic and eddy current coating thickness gages. Test Method D 6132 describes non-destructive measurements over non-metal substrates made with ultrasonic coating thickness gages.